A classic choice for patient dignity. Cloth-like outer cover is comfortable against skin, helping to minimize the risk of irritation and rashes. Skin-safe "grab anywhere" closure system helps to reduce waste. 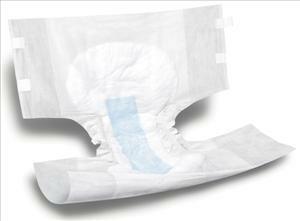 Ultra-absorbent core helps keep moisture away from the skin, and breathable side panels help to provide increased airflow and comfort. Compressed packaging for lower storage cost.